This is made up of parishioners from St Matthews C of E Church, St Johns Methodist, and St Mary’s New Mills. There are normally four functions a year held at St Matthews Church Hall and they are held on a weekday evening and comprise a shared supper followed by a speaker and then hymn singing. Singing is accompanied by the Hayfield Music Group, which consists of members of St Johns and St Matthews who sing and play musical instruments. The events are normally advertised in our Newsletter. Usually 10 to 20 persons from St Mary’s attend, and newcomers are very welcome – even those who do not reside in Hayfield. The churches involved are St Mary’s New Mills, Christian Revival, Providence United Reform Church, New Mills Methodist Churches and St Georges Church of England. The group meets quarterly on a rotating basis at venues set by the host church and tend to focus on planning joint social and religious events across the Christian Churches in the town but share many more events which are normally done on a rota basis (e.g. Christmas Service, Easter Service, shared tables, Prayer walks, Christian Aid collections, One World Day) Each Church should send at least 2 representatives. 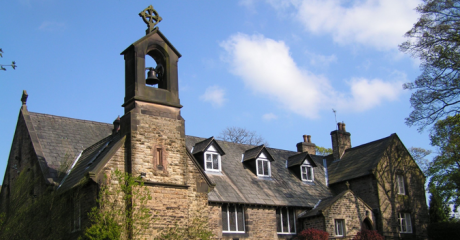 All the churches and church groups in and around Marple, Mellor, Compstall and Strines are part of Churches Together. The group meets quarterly and each church send two representatives to the meetings. The denominations take it in turn to be Chair. Joint services are held at Christmas and Pentecost and a series of talks or house groups are held during Lent. Some of the churches come together for a monthly Sunday evening service. There is an annual sponsored walk to support the “Wellspring Centre” in Stockport. On Good Friday Churches Together organises the ‘Walk to the Cross” on Cobden Edge. The Justice and Peace Group meets once a month. It is an ecumenical group and links in to the activities in the Nottingham, Shrewsbury and Salford J&P diocesan commissions as well as national campaigns and events. The group aims to: co-ordinate action on specific issues; act as a resource in the holding and distributing of information; provide a forum where ideas may be explored and strategies planned.